"Be opened!" is the command that Jesus proclaims in a strong way. He miraculously heals the deaf-mute, the man’s ears are opened, his speech impediment is removed. Thus the life of that man changes completely and finally he can speak plainly with other people. With his intervention, Jesus helps those who invoke Him and are in need; He helps them to recover their faculties and reduce their suffering. Healing is the action that serves to overcome physical evil, to help spiritual progress. The deaf-mute recovers his faculties to speak; but now he should know how to use them well; Jesus provides the deaf-mute with the completeness of the means, the deaf-mute has the task of continuing the work begun by Jesus so that the victory over physical evil can mean real spiritual progress. How much hope comes to us from the Word of God! We were welcomed by the prophet Isaiah with an invitation: "Be strong, fear not! Here is your God, " The promises that the Lord addresses to us, on behalf of the prophet Isaiah, are fully realized by the Lord Jesus. He healed the sick, the blind received sight, the deaf heard, the lame walked! Even today Jesus is here with us to heal our eyes, the eyes of faith, to purify our hearts to open them to His love, to reinvigorate our distrust by transforming it into hope in Him. We are the poor to whom the Kingdom has been given. Whenever we place ourselves before life, others and the Lord with the awareness of our being limited creatures in need, God the Father chooses us to make us rich with His presence of love that saves and redeems. His love causes hope to be born in us. It is a hope which is life for everyone, for every situation. "He has done all things well", it is said about Jesus. Jesus spent His life for others. He witnessed the love of God, our Father, loving His neighbor until He gave His life out of love. On January 27, 1928, Jesus told Luisa that the Kingdom of the Divine Will was enclosed in the Redemption and there was no act that Jesus did which did not enclose both one and the other; with this difference alone: that what pertained to the Redemption Jesus manifested outside, He made known and He gave as gift, because it was to serve as preparation for the Kingdom of the Divine Will; while what pertained to the Kingdom of the “Fiat” Jesus withheld within Himself, as though suspended in His Divine Will Itself. When God decides to issue an act outside of Himself, to do a work, a good, first He chooses the creature in whom to deposit His work, because He does not want that what He does remains in the empty space and without effect, and that no creature should be the depository of His goods. Therefore, God calls at least one of them, so that, if the other creatures, ungrateful, do not want to receive His goods, His works are deposited in this one at least; and when God is sure of this, then does He operate. So, in the Redemption, the depository of all Jesus’ acts was His inseparable Mama. It can be said that, as He was about to breathe, to cry, to pray, to suffer, and everything else He did, first He called Her to receive His breaths, His tears, His suffering, etc., in order to deposit them in Her, and then He breathed, cried and prayed. It would be unbearable to Him, and a sorrow which would surpass any other sorrow, if He had not His Mama in whom He could deposit His acts. Since all the acts of the Kingdom of the Divine Will are enclosed in those of Redemption, even from that time He called Luisa; and as He deposited in the Sovereign Queen of Heaven everything that regarded the Kingdom of Redemption, so did He deposit in her what regarded the Kingdom of the Supreme Fiat. This is why Jesus wants Luisa to follow Him, step by step; and if, a little child, He cries, He wants her near Him in order to give her the gift of His tears, with which He impetrated for her the great gift of His Divine Kingdom. If He speaks, He wants her near Him to give her the gift of the word of His Will; if He walks, to give her the gift of His steps; if He works, to endow her with His works; if He prays, to give her the gift of His prayer, in order to impetrate His Kingdom for the human family; if He makes miracles, to give her the gift of the great miracle of His Will. And so, if He gives sight to the blind, He removes from her the blindness of her human will to give her the sight of His Will; if He gives hearing to the deaf, He gives the gift of acquiring the hearing of His Will; if He gives speech to the mute, He loosens us from our muteness in His Will; if He straightens up the lame, He straightens us up in His Will; if He calm the storm with His empire, He commands the storm of our human will to no longer dare to agitate the pacific sea of His. In sum, there is nothing He does and suffers which He does not give us as gift, in order to deposit in us the Kingdom of His Will, so loved by Him, and formed within Himself. It would have been for Jesus the greatest of His sorrows, while forming with so much love the Kingdom of the Divine Will within Him, in His Humanity – the primary purpose for His coming upon earth – and forming this Kingdom of His in order to restore It in creatures, if He were not to be sure, as He was for the Redemption, that at least one creature would receive the restoration of the Kingdom of the Divine Fiat. And so He looked at the centuries as one single point, and He found Luisa, the chosen one, and even from that time Jesus directed and deposited His acts in her, in order to dispose His Kingdom. And just as for the Kingdom of Redemption He spared nothing – neither toils, nor pains, nor prayers, nor graces, and not even death – so as to be able to give to all sufficient and abundant graces and means so that all might be saved and sanctified, even though He placed and secured everything in the Celestial Queen – the same for the Kingdom of His Will: even though He secured everything in Luisa, He is giving so much, He is sparing nothing - neither teachings, nor light, nor graces, nor attractions, nor promises – in such a way that, if all want to receive the great good of His Will to let It reign within themselves, all will find superabundant means and helps in order to live a good so great. Therefore, Luisa’s coming on earth in time was awaited by Jesus with such love, with such yearning, that she cannot even imagine; because Jesus wanted to deposit the many suspended acts done by His Humanity in order to form the Kingdom of the Supreme Fiat. 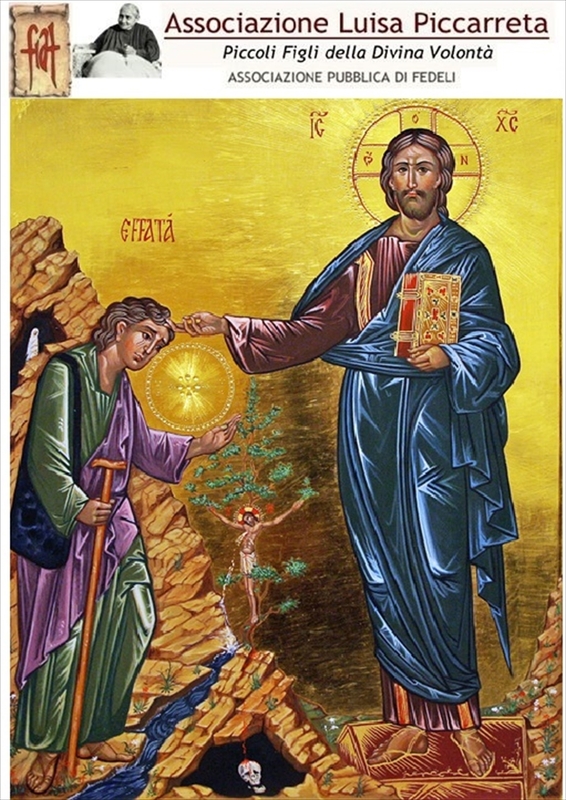 If we knew what a suspended act done by our Jesus means, how we would hasten to receive all the deposit of His acts so as to give life to these suspended acts, because they contain as many divine lives; and we would hasten to make them known to the other creatures.